Hung is a retired headmistress who finds out that a kindergarten in a village called Yuen Long is looking for a headmaster. This particular kindergarten only has five poor students. She realises that if the kindergarten is not able to hire a headmaster in time, it will be rebuilt into a garbage room. Find out what Hung will do to help these five children. This film is based on a true story of a headmaster who stands by her principle and faith to run a kindergarten for underprivileged kids, regardless of the very low pay and difficulties, and in the end her sacrifice finally wins the respect of the public. I got to know about this film when Sky Films in Taiwan (華映娛樂) publicized heavily on Facebook, but I did not know that it was showing in Singapore until I chanced upon the film in Shaw’s website. As usual, I caught the film without watching the trailer, catching only glances of how many Chinese film critics were touched to tears and raved about the film. Oh well, true confession: I watched it for Miriam Yeung (and Louis Koo) as I love her natural and unique way of acting. This film was different, it was based on a true news and story about Principal Lilian Lui Wai-hung. Adaptation films are not common in Hong Kong and I was curious what made the director filmed this unpopular genre of film. In the end, this is what I saw. No special effects, no action scenes, no gun-fight scenes, no intimate romance scenes, it’s a totally un-Hong Kong-ish film. It was a tear-jerker, but the film didn’t use the typical soppy scenes to make me cry. This is not the first time Miriam Yeung and Louis Koo collaborated and act as a couple in a film. They were in 2014 “Don’t Go Breaking My Heart 2 (单身男女2)”, “Aberdeen (香港仔) and 2002’s “Dry Wood Fierce Fire (干柴烈火)”. While I like Miriam Yeung’s motherly and passionate principal character in the film, I was impressed with Louis Koo’s very subtle and simple charm. It’s unlike his previous characters, it was very real and simple. There weren’t a lot of lovey-dovey scenes in the film, and it was the little actions that brought out the husband’s love for his wife and touched the audience. The film touches on a very real topic about the current society. 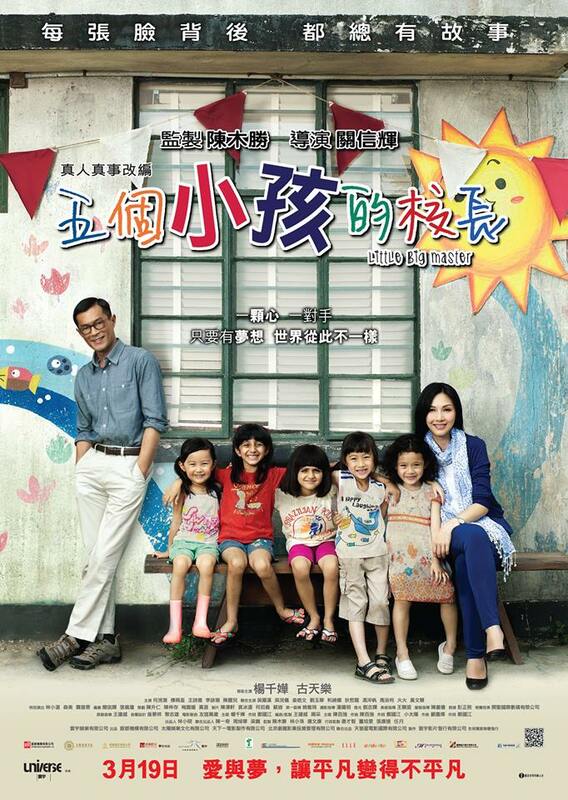 While set in Hong Kong, the film discussed showed the social problem of how many neighbourhood schools were forced to close down, as well as the elitism mentality amongst the local. This is definitely a common problem in developed countries, which means the Singaporean students are also suffering from the pressure-cooker school system. I was impressed how the director was able to touch on many important aspects of life, one of which is the impact a teacher have on their students. Similar to the film, there are actually many tuition centres in Singapore whose aim is to capitalise on the education system and and squeezing the parents’ hard-earned money and stressing on the students. While many are impressed with Miriam Yeung’s rapport with the 5 little girls, I was in love with the girls’ chemistry with their on-screen families instead. There’s Ka-ka (Fu Shun-ying), her disabled dad (Philip Keung) and subdued mum (Jade Lau) who were often terrorized to move out of their home by land developers; Chu-chu (Keira Wang) and her busy aunt (Anna Ng Huan Yi) who dare not express her love for the little girl who had lost her parents in a car accident; Siu-suet (Winnie Ho Yuen-ying) with her scrap-collecting father (Richard Ng); and the most unique of all, the Pakistani sisters Kitty (Zaha Fathima) and Jenny (Khan Nayab) in their little forgotten community where their father did not see the need of girls receiving education. The four families, together with the principal and her husband, which means a total of 5 sub plots were well presented, and every single family was unique and memorable in their own way. You might be able to resist the melodrama-type of crying, but when you watch how the little kids try, in their own way to reach out to their parents, you can’t help but reflect on your own life. I teared when Principal Lui taught Chu-Chu how to face her fears, I was touched when the parents reminisced about their childhood dreams and I cried when Ka-ka did not want to “move on” and graduate. Although there are numerous subliminal messages which might be overwhelming if applied to other films, I can’t help but be affected by the cast’s penetrating performances. As we grow up, things get more complicated and we tend to forget and overlook the simplest thing. We impose our ideas on people we love, such as our kids, and forgot that this might be what we wanted but not what they wanted. To all teachers out there, hope this film can bring back your passion in teaching our little sunshines. Updates: Despite the positive reviews, the box office was not as well-received in Singapore due to the lack of publicity. Just 2 weeks into screening, the timings for the film is only left with 2.20pm daily at only one cinema (Shaw @ Nex) in Singapore. Director Adrian Kwan was so emotional and passionate about the film that he cried while telling Louis Koo the story of the film. “He spent about 30 minutes trying to tell me the plot, but started crying after two minutes, I could not hear anything he said in the next 20-odd minutes.” Louis said. He also related how after every take, the crew would have a weird moment where they would wonder if they did alright, as they had to wait for the director to stop crying first. Principal Lilian Lui Wai-hung, whose story the film was adapted from managed to increase the number of students to 60+, but her salary is still HK$4,500 (same as when she took up the position in 2009) because the school’s expenditure increases as the number of students goes up. She even expressed that she would not want a raise throughout her life. It was one of Louis Koo’s few roles where he don’t have to fight or hold a gun. The role was also not his usual cool and charming character (like Branson Cheung in Triumph in the Skies). But Louis Koo said that it wasn’t as simple as he thought as he had to sing in the film, the most challenging part for him (and the production crew as they had a hard time convincing him). During one of the kids’ birthday, he even sang the popular “Let it go” song to cheer the kids up. Besides that, he also had to cry for nearly a day in the final graduation scene. Check out Little Big Master (五个小孩的校长)Official Weibo and Facebook Page! Little Big Master (五个小孩的校长) is out in cinemas on 19 March 2015. I have watched this movie twice in Johor Baru in Malaysia. A very good director. It was fantastic! I like it in Cantonese because it is original. Thumb UP! It really is a touching story, when I read about how the director cried a lot it really should be heart warming. Watching out for this!! This seems like a really nice movie people who want to get inspired should watch. 🙂 I can definitely understand how this film is very un-Hong Kong-ish. But I’d love to watch this for the moving story and even greater acting. Too bad this isn’t showing here in Manila. 🙁 Will still have to wait for the dvd release. I like Louis Koo for his coolness, bit this Little Bis Master movie will be a twist. Perhaps he can sing. Maybe thus can go into my box of “movies the kids can watch over the hols to improve their mandarin” :). I am not sure my kids will like that but thanks for the inspiration! It looks like a good movie that touches societal issues. Too bad it was not received well in the box-office. I hope it receives awards instead and then gain viewership because of that. Would that be possible? Wow, I want to watch this movie, being a teacher myself. Heartwarming movie. I would love to have a copy of this one. I like these types of movies. What a very unique story. And after learning that it was based from true events as well, it made me want to watch the film more. This looks like a really cute movie with the kids at the helm. Kids and adults would love watching the movie. Wow, I foresee one inspiring movie here, stand by strong principles and fighting for a good cause. I would love to see Little Big Master, hope they show it in cinemas here in Manila. The scenes looks very emotional and surely need a tissue ready while watching such a lovely family movie. This looks like a movie I would enjoy with my oldest daughter. She loves these kind of movies along with me. I wonder if it’ll make it’s way here so I can watch it. This looks like a tear-jerker. I like the plot and I want to watch the film. I think Little Big Master has powerful messages to communicate to its viewers. I hope to see this one. Seems a cute film for young and old to see. How I wish we could watch it in local theaters in our place. I wanted to watch this movie so desperately. The kids looks so cute!~ The headmistress is really a wonderful teacher! Sounds like a very powerful and touching movie. I would love to see this. I think, this is a family movie that everyone wants to watch. A culture-learning which is good for new generation.